The Nuneaton lifeboat movement sounds such a strange thing to have, being so far from the sea, but Nuneaton up until this day has always been a staunch follower of the RNLI. The fundraising started nearly 10 years earlier, after 27 lifeboat crew members from two of the three boats sent out to help the stricken 'Mexico' off the west coast of England on the 9th December 1886, lost their lives in appalling weather. Five years later a committee was set up to raise funds for the families of the men lost on that fateful night. In 1891, the first street collection for those brave sea faring men took place in Manchester. 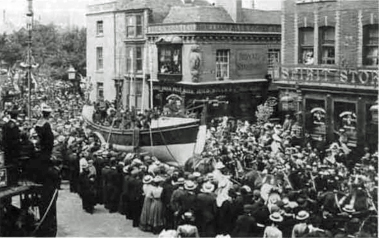 It involved having two real and very heavy lifeboats dragged through the streets for all to see. As the boats passed the crowds (estimated to be 30,000) they were encouraged to donate, by throwing contributions into buckets. That day they raised £600 from the buckets and over £5500 from major donors. Hoping to ignite the Nuneaton branch, saw Sir E.N. Newdegate preside as president, Mr Reginald Stanley was vice president and Mr F Adams treasurer. First up they set about distributing miniature life-boat collection boxes in workshops, licensed houses and banks for a week. Then the women's committee gathered in town on Saturday 10th September 1898, the spectators on the football fields were canvassed and the ladies cheerfully pursued their labour of love, wandering in and out the crowds, advocating their winsome ways. Mr E.A Shute (below) was reciting Macbeth with 'great power' and 'dramatic brilliance'. Mr Tom White, Nuneaton's favourite tenor was also on the bill and was greeted with much applause from the gathered audience. The evening was finished off with illustration's showing how the brave men all round the coast of Great Britain risked their lives to save up to then 40,474 people. The street collections by the ladies committee managed to raise £8 4s 3d. The Miniature lifeboats boxes left in workshop and licensed houses raised another £13 6s 8d (about £1600 in today's money) not a bad weeks work I say.